Greece is glorious – fact. And you can enjoy getaways to seven sparkling Greek destinations, meaning you’ll have bags of choice for the ideal trip abroad. Whether you opt for an island or stick to the mainland, you’ll be spoilt for beaches, traditional restaurants, and oodles of history and culture. Greece holidays are all about enjoying the sun-kissed beaches, thriving culture and rich history. Find yourself stepping between worlds: one moment you’ll be browsing and buying gifts in glamorous shopping malls, the next, you’ll be enjoying traditional dishes such as moussaka in rustic seaside tavernas. With their cooler climate, abundant olive and cypress trees, and forested mountains, the Ionians (Τα Ιόνια Νησιά) are a lighter, greener variation of Greece. Though the islands lie linked in a chain along the west coast of mainland Greece, each - as you will discover - has its own distinct landscape and history. The four Sporades islands (Οι Σποράδες) remain largely off the beaten island path. Away from this workaday hub, the pace slows as the landscape stretches out, dotted by hilltop monasteries, small farms, vineyards, hidden bays and curious goats. There’s something undeniably artistic in the way the Cretan landscape unfolds, from the sun-drenched beaches in the north to the rugged canyons spilling out at the cove-carved and cliff-lined southern coast. In between, valleys cradle moody villages, and round-shouldered hills are the overture to often snow-dabbed mountains. Take it all in on a driving tour, trek through Europe’s longest gorge, hike to the cave where Zeus was born or cycle among orchards on the Lasithi Plateau. Leave time to plant your footprints on a sandy beach, and boat, kayak or snorkel in the crystalline waters. On a quest to find the Greek islands of your dreams? Start, here, in the Cyclades (Κυκλάδες). Rugged, sun-drenched outcrops of rock, anchored in azure seas and liberally peppered with snow-white villages and blue-domed churches, this is Greece straight from central casting, with stellar archaeological sites and dozens of postcard-worthy beaches. Ever pined for the old Greece, where timeless islands beckon modern-day adventurers just as they did Odysseus and Alexander? Enter the far-flung Dodecanese (Δωδεκάνησα; do-de-ka-ni-sa) archipelago, curving through the southeastern Aegean - beyond better-known Rhodes and Kos - enigmatic islands beg to be explored. The Greek Islands ignite the imagination and satisfy the soul with a history laced in mythical tales and told through ancient, sun-bleached ruins. The days melt from one to the next, filled with miles of aquamarine coastline blessed with some of Europe’s cleanest beaches. Many travellers simply settle down and never go home. Greek holidays are made for families. Just grab a short flight from your nearest airport, and head to one of the many beautiful islands; from Zante and Rhodes to Crete or Corfu. Wherever you choose to visit, you’ll have fun building sandcastles, learning all about the history of the island and having a great time watching entertainment at the hotel. Holidays to the South Aegean Islands always deliver – whether you're watching the sun set over Santorini's caldera or watching it rise in Mykonos after a night of parties. Holidays to the North Aegean Islands take you to underexplored Greece. Out here, the towns are traditional, the coves are quiet, and the landscapes are green. Villa Haroula a real jewel on the dream landscape of Parga, translates into reality the noble aspiration of it's people for providing high standard services and giving their visitors a real holiday experience. In a rural location through a pine forest a short distance from the main road to Koukounaries , this delightful complex of apartments, studios and maisonettes is set among lovely gardens with a real get-away-from-it-all feel. 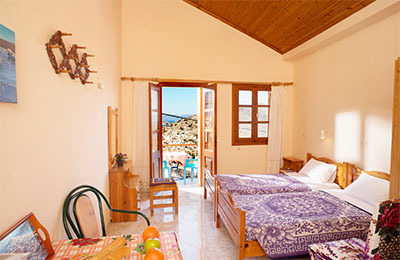 Sevasti Symi Studios offer guests a comfortable standard of accommodation, and a warm family welcome. Located high up on the hill side over looking the village, with an amazing view of Pedi, Pedi valley, Chorio, Kastro and beyond. 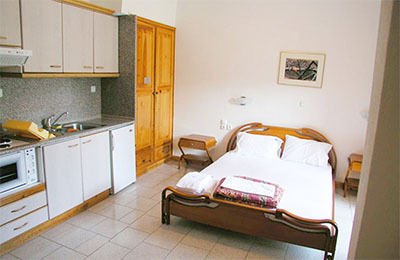 These pleasant studios are in a perfect location for those wanting to enjoy all that Symi has to offer. Restaurants and shops can be found approximately ten minutes away, and are ideal for those looking for a 'get away from it all' holiday. Soak up the heat on the generous sun terrace next to the pool at Norma’s Village, in the Panormos Valley, on the small but beautiful island of Kalymnos. Just a few minutes’ walk from the beach and main square makes it a great base for friends, families and couples. There is either a mountain or sea view from bright rooms at the friendly Maria Anna Hotel in the resort of Lourdas, Kefalonia. The Taxiarchis Apartments, in Skiathos, are in a prime position within a few minutes’ walk of the lovely sandy beach and a short walk to the numerous bars, shops and restaurants in Skiathos Town. These newly high standard renovated apartments which offer all the now a day’s comfort that you need for a relaxing holiday are situated just a 5 minutes walk from the centre of Tingaki and Tingaki beach, with restaurants, bars and mini-markets all around. 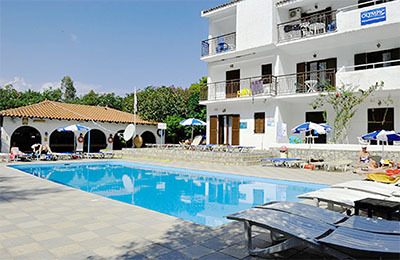 The friendly, family-run Elarin Studios and Apartments are located just 800 metres from the centre of lively Faliraki with its restaurants, bars, clubs and water park, and only a five minute walk from a lovely sandy beach. Crisp white bedding is always a welcome sight when arriving on holiday and the Manousis Studios meets the brief. In a peaceful part of Tsilivi, yet within in walking reach of both Zante Town and the sandy beach, the apartments suit both couples and families. Everyone will love the well-equipped apartments which have either a veranda or balcony with mountain or pool views. The Acropolis is one of the most important ancient sites in the Dodecanese and attracts thousands of visitors from all over the world – it is a great bonus to have panoramic views over this landmark site from the Lindos Gardens studios and apartments. Share in the secrets of lesser-known gems on the beautiful coast of mainland Greece. There are plenty of options for all holiday types from classic Mediterranean resorts with unspoilt fishing villages full of tranquil charm and vibrant and culture-filled cities such as Athens, Kavala and Thessaloniki. Lassi is about as relaxed as they come. Live the dream by simply hopping between beach bars and your sun bed, or step things up a gear and take a trip to the island’s charming capital, Argostoli. With its rugged mountains, lush vineyards and vast, golden beaches, Kefalonia is a picture-book island paradise to uncover. A wealth of hidden gems, Kefalonia is the largest of the Ionian islands with dramatic mountains, lakes, pretty pebbled beaches, sandy bays and crystal clear waters. A must-do is a visit to the amazing Angalaki and Droganati Caves where the extraordinary underground lakes change colour during the day. This purpose-built resort has got holiday vibes in spades. With beaches that wouldn’t look out of place in the Caribbean, café-lined streets and stacks of shops, you’ll be more than happy in Hanioti. Make a beeline for the mainland! Oozing culture and history, plus a swoon-worthy seafront, this slice of Greece is great. Gorgeous Greek looks, a famous landmark and a great late-night scene? It has to be Lindos. After nosing around the Acropolis’s ancient nooks, hit the cobbled streets for al fresco wining and dining. Pristine beaches, dense forests, medieval towns, buzzing nightlife – you can get the best of the lot on this all-ages island. If shopping and cocktails are on the cards, swanky boutiques and marina-side bars are waiting in Aghois Nikolaos. There’s a handful of beautiful beaches to sink into, and a lovely lake to wander around too. Sandy beaches, seafront tavernas, ancient palaces, delicious cuisine, neon nightlife – this sun-soaked island has the lot. Oozing charm and traditional touches, this is go-slow Greece to a tee. Tuck into meze on a vine-shaded taverna, kick back on the island’s best beach, and see the salt flats to really soak up the atmosphere of Alykes. Zante’s just off the south-west tip of the mainland. Families come to relax, clubbers come to party and sea turtles come to nest. Beach lovers head this way! Zante boasts golden sands as well as hidden coves with picturesque views. Zante is the full package for a captivating holiday with so much to see and do for couples, groups and families from playtime, partying and rural retreats , just take your choice. Corfu is a dreamy Greek getaway, where secret coves, olive-strewn hills and bustling beach resorts merge on one island. At the entrance to the Adriatic Sea, Corfu is often referred to as the Emerald Island for its pine forested mountains and wonderful olive groves, drawing admirers back year after year. It’s the perfect setting for a tale or two of Greek legends and myths. Enjoy a choice of lively party towns, laid-back seaside resorts and traditional fishing villages, all topped off with beaches. Kos has got it covered; the second largest, inhabited island in the Dodecanese has a coastline that stretches over 290 kilometres. Not just a party island, Kos also the ideal choice for those in search of a little piece of traditional Dodecanese life and a quieter pace of life, with lots of hidden coves and sleepy villages to explore, among stunning scenery.